Single piece steel uprights and crossbars are all made from 60mm diam x 3.2mm thick tubular steel. Powder coat white paint finish. Supplied with steel ground sockets complete with hinged lids. The heavy duty galvanised steel hinged assembly consists of two flat plates which are securely held together with four vertical bolts. The bottom plate has a spigot which fits into the steel ground socket, The top plate has a spigot over which the bottom upright of the rugby posts fits and is bolted in place. There are two large horizontal bolts which are fitted to the plates and these are the bolts which allow the hinged movement to take place. Size: 7.32m (24’) out of ground height. Size: 10.06m (33’) out of ground height.. Size: 11.6m (38’) out of ground height.. 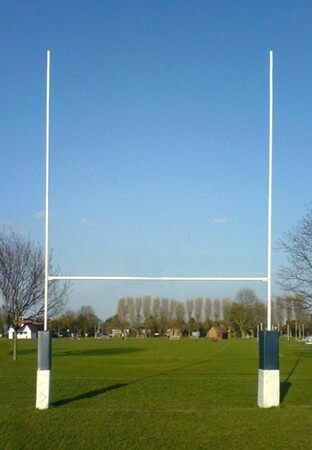 Please Note: A standard socketed version of these goals is available - See Standard Steel Rugby Posts 7.32m.